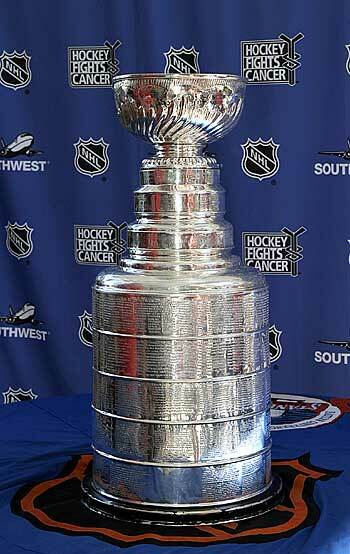 Tonight the NHL playoffs begin. I'm not going to argue about how the road to the Stanley Cup is more difficult than in the other big sports leagues (but trust me, it is). Like any other good hockey fan I've made my own picks as to who will be advancing and who will be hitting the links earlier than they would like. Of note for you non-hockey fans: 16 teams make it and play best of 7 game series'. The league is split into 2 conferences roughly geographically in East and West, and within that there are divisions. The regular season is 82 games, and the winning team could play up to 28 more games for a total of 110 games. The top team of the East and the top team of the West play each other in June (roughly) for the Stanley Cup. Vancouver Canucks vs. Chicago Blackhawks: Vancouver had the best regular season record in the NHL. Chicago won the cup last year. My pick? Vancouver in 5 games. Chicago let go of a lot of quality players at the end of last year and aren't the team they were. San Jose Sharks vs. Los Angeles Kings: Full disclosure, I'm a huge Sharks fan. That being said, I dislike the Kings. My dislike for the Kings is not as strong as it is for the Ducks, but I'm a Bay Area boy and grew up with the "Beat LA" chant for Giants games and Niners games (when LA had a team). It's no secret the Sharks struggled this season, but they came on strong in 2011. Sharks in 5 games. This series starts tomorrow night, 7pm (PDT) on Versus. If you follow me on Twitter it'll be all #SJSharks. Detroit Red Wings vs. Phoenix Coyotes: Detroit is the team most other teams measure themselves up against. They are fixtures in the playoffs. Phoenix is that scrappy underdog who people write off, only to find them getting in the playoffs. I like Phoenix and I want them to do well, but it'll be Detroit in 6. Anaheim Ducks vs. Nashville Predators: This is a tough one. I very much dislike the Ducks (I'm trying to stay away from the word "hate") but I have to admit if there was a team that was coming on strong in the last quarter of the season than the Sharks it would be the Ducks. Nashville gets overlooked often, but they have solid defense and goal tending. I think in the end the Ducks will get past in 6. Washington (D.C.) Capitals vs. New York Rangers: The Caps have to prove they're not playoff chokers, though as a Sharks fan I thank them for taking that mantle off of the Sharks. With the league's flashiest player (Alex Ovechkin) not performing at his usual level during the regular season people are wondering if he's saving it for the playoffs. The Rangers are scrappy with solid goal tending, but I gotta go with the Caps in 6. Pittsburgh Flyers vs. Buffalo Sabres: Going to be honest here, I don't like the Flyers that much, and I don't follow the Sabres that much. So blindly picking someone here, and I'm going with the Flyers. in, oh I don't know, 6. Boston Bruins vs. Montreal Canadiens: I spent some time in Boston, so I'm a bit of a Bruins fan. This could be the most explosive series as we have two of the original 6 hockey teams going at it. There's history here, and some animosity between these teams for incidents that occurred during the season. Boston will grind this one out in 6. Pittsburgh Penguins vs. Tampa Bay Lightning: It always amuses me that Florida has hockey, but I suppose that no less odd than California having hockey. Especially when you consider Tampa Bay has a Stanley Cup. The Penguins have loads of star talent in forwards Sydney Crosby, Evgeni Malkin, and goalie Marc-Andrew Fleury. Too bad the NHL's poster boy Crosby is likely to miss the first round due to concussion symptoms, and Malkin is out for the rest of the season. As much as I became a fan of the Penguins through HBO's well done 24/7 Winter Classic, I think Tampa will wear them out in 7. So, with those first round predictions I think the two teams that will end up fighting fot the Cup will be Vancouver from the West and Boston from the East. To all you Sharks fans out there, I feel like I have to apologize. I want the Sharks to be there, but when you look on paper at the two teams Vancouver has more for them. But the great thing about live sports are the intangibles you can't factor in. Will Luongo choke under the pressure, as some think he will? Will the Sharks rise up and play at and beyond their potential? I sure hope I'm wrong about this last one.